DSTYLE PLUS SERVICE HISTORY ! 99% FINANCE APPROVAL ! 99% FINANCE APPORVAL ! 2 KEY'S, COMES WITH SERVICE HISTORY ! LOOKS AND DRIVES FANTASTIC ! FANTASTIC COLOUR COMBINATION ! GR8 MPG RETURN ! MOT EXPIRES 13/08/2019 ! OIL SERVICE ONE ! COMES WITH 12 MONTHS AA BREAKDOWN COVER !, Service history, Excellent bodywork, Black Cloth interior - Excellent Condition, Tyre condition Excellent, 17in Bellone Black Alloy Wheels, Air Conditioning, Automatic Digital Air Conditioning, Automatic Rain-Sensitive Windscreen Wipers, Connecting Box - Bluetooth System with USB Socket, Cruise Control with Speed Limiter, Dark Tinted Rear Windows, Front Electric Windows with One-Touch Operation on Drivers Side, RDS Stereo Radio/MP3 Compatible CD Player with Auxiliary Socket, Rear Parking Sensors, Alarm, Immobiliser, Front and Rear Head Restraints, Interior Mood Lighting, Third Brake Light, Traction control, Rear Wash/Wipe, Lumbar support, Leather Steering Wheel with Aluminium Effect Inserts, Height-Adjustable Drivers Seat, Height and Reach Adjustable Steering Wheel, CD Player, Daytime-Running LEDs, Body Coloured Bumpers, Chrome Side Rubbing Strips, Driver and Passenger Sunvisor with Covered Illuminated Courtesy Mirror, Rear 1/3-2/3 Split/Folding Seats, Remote central locking, Steering Mounted Controls, Front Fog Lights, Electric door mirrors, 6 Speakers, 3x3 point rear seat belts, Cruise control, Drivers Airbag. 5 seats, Purple, 2 owners, ALL CREDIT/DEBIT CARDS ACCEPTED, FINANCE ARRANGED, PX WELCOME, £99 DEPOSIT RESERVES THIS CAR, CALL US NOW TO VIEW THIS CAR NOW ON 0191 477 8203 DAYTIME OR 07786 679 880 ANY TIME 7 DAY'S A WEEK. 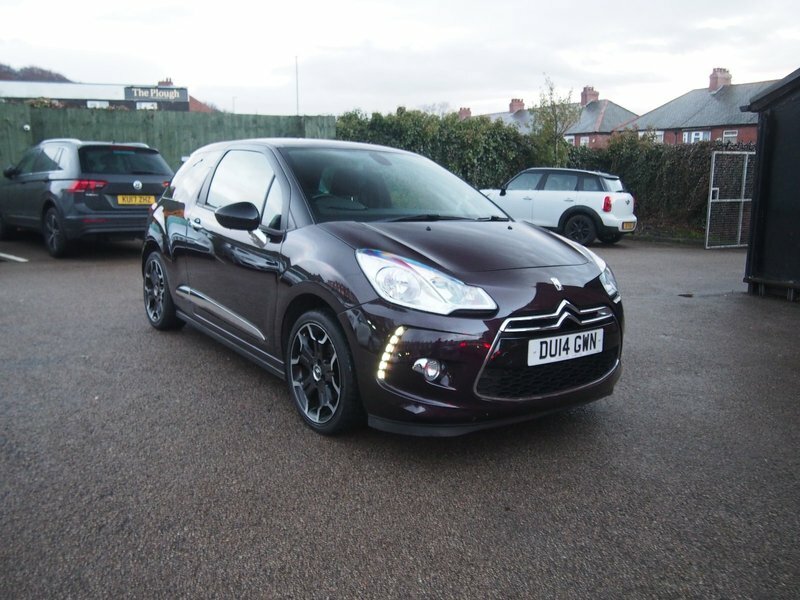 I would like to make an enquiry about your 2014 Citroen DS3 DSTYLE PLUS SERVICE HISTORY ! 99% FINANCE APPROVAL !